Nightmare Games Video Games and More! Want to become an admin of the forums? 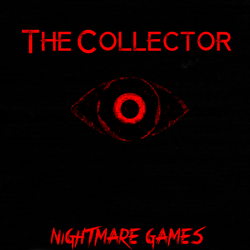 The Collector is a 3rd person/ possible first person intense gore filled puzzle horror game. As you struggle to remember where you are or how you got there you must fight for survival and find your daughter or you can stop the collector once and for all. The story it self is very engaging, the connection between you and the charecter is almost impossible not to connect with. You will often hear him speak his mind about what just happend,thoughts,puzzles, and his feelings as he slowly becomes insane.But be warned, stay in a certain area too long and you can do further mental damage to the charecter,this is when entitys come after you and the collector will show his face right before you gaze upon the "watchfull eye"
Features in the game plan to be Melee combat, melee weapons, Guns, smart ai, human enemys, enemy entities, side puzzles(may connect to the story), challenges,traps, possible drivable vehicles,gore,gore, and more gore! The masked men are one of the enemys, As for the entitys, one of them is a misteroius door called "The Watchfull Eye", what this entity does or causes is undecided. The feature of multiplayer is not decided, If there is multiplayer a cool feature would be to play as an enemy or entity and there would be 1v1, but there might be some team deathmatch or CTF! There will be a kickstarter soon!